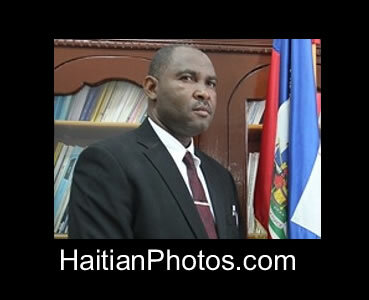 Here is a picture of Jean Beauvois Dorsonne, the new Minister of Education. On Tuesday, March 29, 2016, Camille Junior Edouard the new Minister of Justice, in the presence of other parliamentarians and other dignitaries, presided over the investiture ceremony of Jean Beauvois Dorsonne as new Minister of National Education. Jean Beauvois Dorsonne has succeeded former Minister of Education Nesmy Manigat who was absent in the investiture ceremony. Jean Beauvois Dorsonne (born December 7, 1966) is a master graduate in social sciences, from college Val de Marne, Paris, France and a law graduate (2003), active lawyer, and member of the Bar of St Marc. He started his career with teaching profession in 1989 and later became a Chief Inspector of the secondary education. He joined the central office of the ministry as a member (May 2010) and became coordinator of the Directorate General of MENFP (2011 to date). He served as a parliamentarian (between 2006 to 2010) as a deputy of the people in the 48th Legislature, and served as the President of the Education Commission from January 2007 to May 2010.